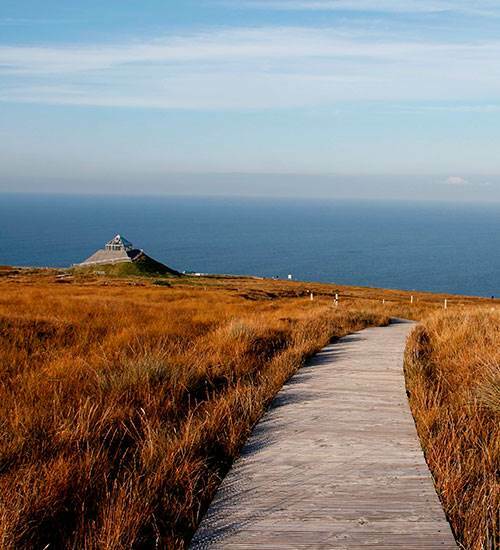 Céide Fields overlooks the mighty Atlantic Ocean which gently laps or vigorously pounds – depending on the weather! – Against the cliffs below. The landscape itself has been forged from the dramatic upheaval and movement of the earth’s crust over millions of years. The soil at Céide Fields has been constantly subjected to the conflicts of the weather. The warm Gulf Stream comes up past the American continent between Ireland and Iceland. In the opposite direction, cold deep waters flow south from the icy Arctic Ocean.